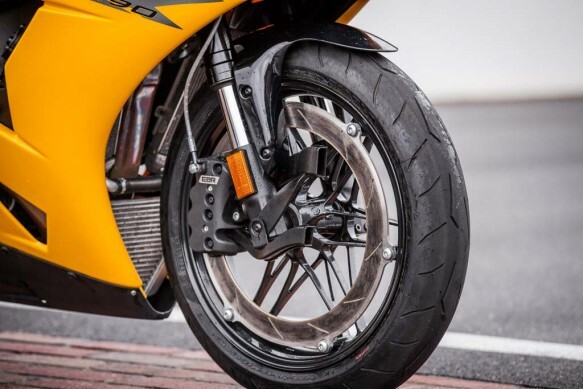 Never one to follow convention, the EBR perimeter brake is said to be lighter than traditional dual-disc setups and provide more direct braking force to the front tire. Behind the tire lies a triangular oil-cooler and the left-side radiator (the fairing hides the other radiator). Steffanelli says two smaller radiators allow the cooling system to be more compact and keep front-end geometry numbers optimal. A single bigger radiator would have to be placed ahead of the forward cylinder header, forcing rake, trail and wheelbase numbers to grow.